PS. re. the growing number of queries about Tower Lord – please rest assured I’m working on it (and looking forward to the day when finally I can sleep). This entry was posted on Monday, May 21st, 2012 at 7:26 pm	and tagged with anthony ryan, lord of the rings, raven's shadow, tolkien, tower lord and posted in Writing Stuff. You can follow any responses to this entry through the RSS 2.0 feed. Congratulation ! Blood Song is one of the best books I have read. I eagerly anticipate Tower Lord. You rock, blood song was one of the best books i have read in a very long time. Not ONCE did i feel the need to skip ahead to get past the constant blah blah blah some authors stick in their as filler. Not many great books this year….this was the first book for this year that I actually stayed up until 4am reading… Thanks for the great read! And I do agree with some of the comments on this blog… you have to advertise more! I will make sure I tell all my friends of how great this book was (my fav this year so far), but if you were able to advertise yourself more you will get such a HUGE following. Just finished reading Blood Song. Haven’t read a book in years since college where I wished I can live without sleep. So dismayed the sequel is yet to come. Anyways, thank you for this wonderful story. Just stumbled on your book and ordered it, caught my eye because if you arrange all 1,217,757 ebooks in order of Avg. Customer Review in the Kindle Store – you are number one. The guy you knocked off the top – Hugh Howey – has had an incredible and inspiring year for an Independent – good company to be in. Congrats and looking forward to starting it this afternoon. That’s something I didn’t know, thanks Joe – another one for my screen-grab collection. Hope you like the book. Check out your rating now… I’ve never seen a rating so good. 106 “5 star” on 6/12/2012. I gave you five stars on amazon also, but I wonder – is some of the rating hype a result of your very low price point. If people had paid $20 for a hardbound version of your book, would it have received the same ratings. Hard to say. It’s readily apparent you’ve mastered the craft of writing and storytelling – and many of your reviewers say that when justifying the five star rating in spite of the few editing errors. I just finished reading Blood Song and I was impressed. It is a very good book. I have two recommendations for you. One, get yourself a professional editor to review your work before you publish. There are many typos/grammatical errors that detract from the reading experience. It is a real put off for most readers and certainly was for me. I will say, though, that your book had fewer such errors than many other self published e-books I have read. 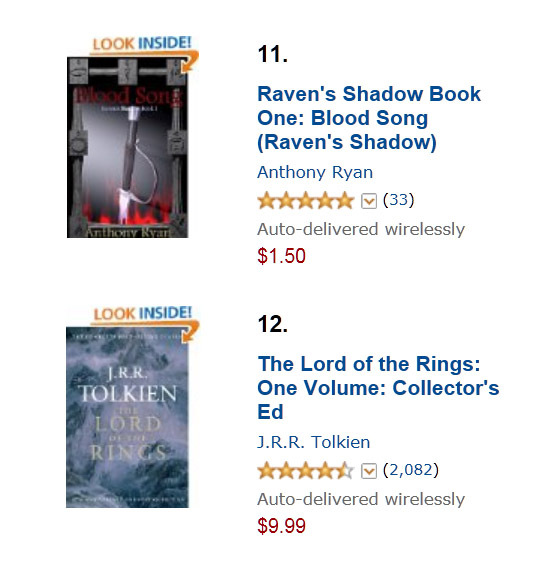 Two, you should consider charging more for your next book in the Raven’s Shadow series. I am 48 and have been reading books voraciously all my life so I know a good writer when I see one. You are a good writer and you should write more. But in order to do so you need financial security to be free to write. Honestly, I thought Blood Song was worth more than the $2.99 I paid for it. It was certainly better than a lot of the $15.99 hardcover crap I see in many bookstores these days. Keep writing and I look forward to reading more of your work in the future.